First outside meeting of the OBTC? In an historic first – probably – the Ocean Beach Town Council held their monthly public meeting outside. 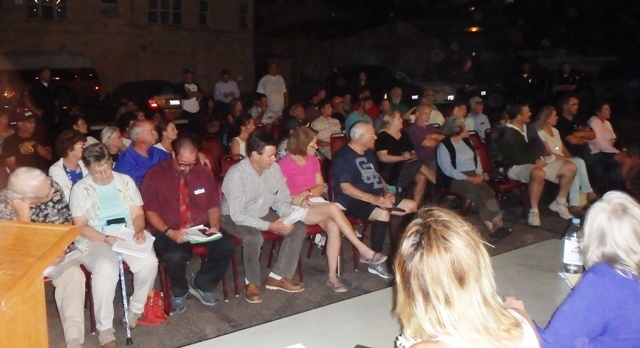 Due to some kind of alarm problem at their usual venue – the Masonic Center – which made it impossible to meet inside, the Town Council met right outside using the blare of lights to illuminate their goings-on. Sixty audience members joined the ten or so OBTC board members. It was a nice change – as it was quiet comfortable outside in the Masonic’s parking lot – inside would have been hot. It also made it almost impossible to read the agenda handed out. Audience at outside OBTC meeting – some are trying to read the agendas. Another reason the meeting was memorable, it had some contention with the last item on the agenda – the request by surf camps in OB to extend their hours. Admidst the usual reports from politicos’ reps and the more common agenda items – the issue of the surf camps drew some vocal opposition from local surfers, and an at time heated debate occurred between the surfers, their supporters and the surf camp managers and their seemingly lifeguard supporter. OB has two privately-run surf camps who use the sand and water at the foot of Newport Avenue. A San Diego city lifeguard manager – Lt. Garlen (sp?) presented the proposal to the Town Council and the community at large to allow the camps to extend their afternoon hours. Some background: there was an RFP (request for proposal) process that occurred between the city and the surf camp concessionaires. The Real Estate Assets department of the city determined the location and signed the MOUs (memorandum of understanding) with the camps that outlined the rules of operation. Hours of operation, etc are set in the MOU. The lifeguards, we were told, are the enforcement branch of the MOU and the liaison with the concessionaires. “As a good partner”, the lifeguards often represent the surf camps. They were there that night to shepard the surf camps through the community process of approval. Now the surf camps wanted extra hours on water time, and extend their lease of the beach from 4 to 5pm, another hour. Andy of the San Diego Surf Camp spoke first from the surf camp reps. He explained that they want to expand their after school program. They have 6 kids with 2 instructors, he said – and always maintain that ratio of 3 to 1. “These are local kids,” he added, and the parents have requested additional hours so they don’t have to rush from school or work. The audience was invited to comment or ask questions. One point that was made was that the operation agreements allow 25 students per school per session. “That’s 50 students in one session,” the commenter concluded. Another person complained of the large, over-sized truck that one of the schools uses – and the parking spaces it takes up at the lifeguard parking lot. Another person suggested the schools – or camps – move to Dog Beach. The rep of the 2nd camp spoke to the audience – from Pacific School Surf School – they’re in PB as well as OB. Someone pointed out that the location of the camps are chosen by the City’s Real Estate Assets. He also stated that expanded hours helps locals, as that’s whom they teach. one said “it’s not a school!” in the traditional sense, as up to 10 to 15 kids are left on their own in the surf, creating hazards for other surfers. This reporter had a question: if the MOU can be amended to change the hours, why can’t the MOU be amended to have the camps moved to Dog Beach? No one really had an answer. OBTC President Gretchen Newsom asked the camps’ reps if they were open to move to Dog Beach? Without really getting any resolve, Newsom admitted that there are lots of questions but asked the audience via a quick hand vote whether they approved the extended hours. The vote was close in rejecting the expanded hours, but as one observer noted, the half dozen surf camps reps and employees and the lifeguards also voted. It’s unclear if the issue will return to the OBTC in October or not. A new flight path for the jets landing and taking off at Lindbergh is being seriously considered by the FAA. They’re looking for public comments and the deadline for those comments is October 8th. The new paths will be implemented supposedly in November 2016. Someone in the audience mentioned that there is a petition at change.org against the new paths, and that they claimed 1500 had already signed it. Conrad Wear of Zapf’s office assured OBceans that the changes wouldn’t affect OB. He did add that the Peninsula planning committee has been active on the issue. Treasurer Donna Zoll, in probably her last appearance as a board member, announced that the OBTC currently has $37,153 in their bank account. The city will finalize its analysis of the cave and the repairs by October 2nd. The contractor selected will basically crack the concrete covering and leave it as it is. Wear of Zapf’s office said construction will be during the week of October 12th. The lifeguard reps at the meeting also reported the crack-down at The Arch – where they joined a task force with SDPD created just for Labor Day. So, over that 3 day weekend, they observed 800 visitors to the Arch on just one day and prevented 600 from jumping off the popular but dangerous spot. That was on Saturday. On Sunday, there were 600 visitors and 700 on that Monday. On Monday, they also had 20 rescues. Lifeguard reps also announced that 2 member of the current OBTC Board, Donna Zoll and Trudy Levenson, will be observers at a much-ballyhooed trial mock airplane rescue planned off the coast of OB. They will have a hundred people in the water during the simulated rescue – Zoll and Levenson will be observers only. This will all come down Wednesday morning around 9 am on Sept. 30th. The Committee of Planning Committees voted against the city’s proposed ordinance to deal with the issue of short term vacation rentals. Their rejection still allowed home-sharing. If you have a solution, send it to Zapf’s office via email. The firm will be opening up another DECCO Bikes stand at Sunset Cliffs and Newport Avenue. They should be up and on board by mid-October, says Conrad Wear. The OBTC gave SDPD Sgt Sal a parking placard with the OBTC seal of approval that allows him – as far as they are concerned – to park in the red zones as he walks around the community. We were told that people actually “hassle” the cop when he’s parked his cruiser in the red. It was announced that air-conditioning for the OB Library – the only library in the entire city system without AC – will be arriving in “a week” – around the time of the simulate airplane rescue. Editor: I apologize for issues or subjects not covered and for not knowing names of people who spoke, but it was somewhat difficult to hear way in the back of the crowd. Um. Dog Beach is NOT an easier break… it’s just more spread out. And dog beach already has enough kooks. ” it’s just more spread out”, Dog Beach. Exactly why it is a better place for the schools. I learned how to surf at “Dog beach” 55yrs ago BEFORE it was called Dog beach. My daughter learned at Dog Beach. Almost everyone I know from back then learned at Dog Beach..Why because it has a LONG whitewater ride off the center of the beach..NOT the Big Jetty not Stub Jetty. You would have been chased out of South Beach, “Go back to Dog Beach and learn” if you were not ready. Dog beach has a flat sand bottom and way less hazards. And unless you are still a beginner people riding the white water off dog beach are rarely going to be in your way. Dog Beach is a WAY better option than all these beginners dumped into a one peak wave, surf speak, at the Pier. Whenever I get someone who wants to learn how to surf I say Dog Beach or Tourmaline. And yes Dog Beach is an easy break compared to others in the area. It would be up to the instructors to keep their students out of the way. easy to do at Dog Beach not so easy at the Pier..
“I just had a really scary vision of the future of surfing in San Diego after attending the OBTC meeting last night…”If you did not pay to be in this surf school you can not surf here”.. We are way closer to this then you can imagine. After last weeks OBTC meeting and seeing how cozy the lifeguards have gotten with the surf schools I can see public and private, paid, surf sessions in our very near future…Just like swimming pools. Finally they have figured out a way to make money out of our ocean. Sadly there are lots of people that would be willing to pay for this exclusive service. Just like swim clubs rent pools, surf clubs, surf schools etc. can buy ocean time..$$$$$ Controlled and enforced by lifeguards…No more localism you and your kids are safe from those mean locals.”… We are so close to this becoming a reality it is scary. Once we sell off our beach it will be gone forever. I hope more beach goers surfers or not realize the impact of having up to 100 “students” on the sand and 50, not counting instructors, PLUS private lessons that are not part of group lessons in the water, will have on our little stretch of beach. I have a theory why the lifeguards are for this. As long as the beach and water are filled with these surf camp students, the lifeguards have additional help in watching the water. The people who run the schools have responsibility for student safety. The lifeguards have the ultimate responsibility but it is much easier on them to have an organized, supervised group in the water. Over the years, I’ve noticed a trend in life guarding that really bothers me. The lifeguards are continually herding people into what they believe are the safest areas and they get irritated if someone doesn’t comply. I’ve had a few words with them myself. As Jimmy Buffet put it, they want people “to swim in a roped off sea” making their jobs easier. Their job is to watch the water and the people in it, not control the people in it but that is what you’ll see on a busy summer day. In my opinion, they had no business speaking up for the surf camps like this. We’ve seen that cop park in front of a crosswalk (by Culture Brewing.) They should be allowed to park in the red, but blocking a crosswalk and ADA curb cut doesn’t make a whole lot of sense.